Sinus infection, or sinusitis, occurs when the tissue that lines the sinus cavities becomes inflamed and swollen. This swelling blocks the sinuses, causing pain and pressure. Mucus can get trapped and lead to bacterial infection. The condition is considered chronic when it lasts for at least eight weeks despite attempts to treat it. 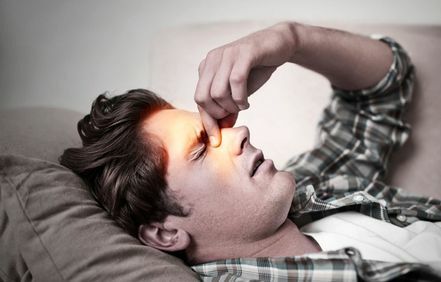 Often, doctors prescribe nasal steroid sprays or antibiotics to treat the symptoms of sinus infection, but these have not been proven to be effective. Many chronic sinusitis sufferers frustrated by conventional medical treatments turn to complementary medicine for chronic sinus infection. In Poway, CA, Dr. Bret Mosher offers an alternative approach using natural therapies. Guided by the principles of complementary and alternative medicine, Dr. Mosher treats the whole person and focuses on finding the underlying cause of sinusitis instead of treating only the symptoms. To schedule an evaluation with Dr. Mosher, please contact our practice today. The sinuses are the small cavities or air pockets located within the bones of the skull and face. They are connected to the nasal passages by small channels, which allow air to flow from the nose into the cavities and allow the drainage of mucus from the cavities into the nose. Sinus problems affect an estimated 30 million Americans. These are often prompted by having a cold or an allergic reaction, and symptoms can also result from a sudden change in the weather. The mucus membranes swell, the production of mucus increases, and the buildup of congestion begins. The reason sinusitis tends to become chronic for many patients is that after each episode, the sinus cavities fail to completely drain the mucus and discharge. An ongoing pattern of infection is then created. Practitioners have used Traditional Chinese Medicine for centuries to naturally and effectively treat sinusitis. Typical treatments for sinusitis in Western medicine are antihistamines, nasal corticosteroids, and antibiotics. Antihistamines are a short-acting solution that can relieve mild to moderate symptoms by blocking the release of histamine. Nasal corticosteroids reduce inflammation of the nose and help ease itching, sneezing, and runny nose. Antibiotics are prescribed when symptoms suggest a bacterial infection in the sinuses. Treating just the symptoms, however, does not help get to the cause of the problem. In addition, repeatedly treating sinus infections with antibiotics can weaken the immune system and add to health problems. Treatment with Traditional Chinese Medicine (TCM) can break the pattern of repeatedly treating symptoms. In addition, these treatments are designed to boost the body’s immune response instead of damaging it. Practitioners have used TCM for centuries to naturally and effectively treat sinusitis. The two main treatment modalities are acupuncture and herbal therapies. Acupuncture can open up the nasal passages and allow patients to breathe more freely. This method focuses on opening the nose as well as strengthening the spleen meridian. Herbal medicines relieve symptoms naturally and can also help strengthen the immune system. An expert in the field of TCM, Dr. Mosher prescribes herbal formulas that are free from chemicals and unlikely to produce undesired side effects. If you are considering complementary or alternative treatments for sinusitis, the importance of selecting a qualified practitioner cannot be overemphasized. Dr. Mosher will conduct a thorough assessment to diagnose your condition, and will develop a safe and effective course of treatment tailored individually for you. If you would like to learn more about how our approach can benefit you, please contact us to make an appointment.